It was cool and overcast, much like it was last year. 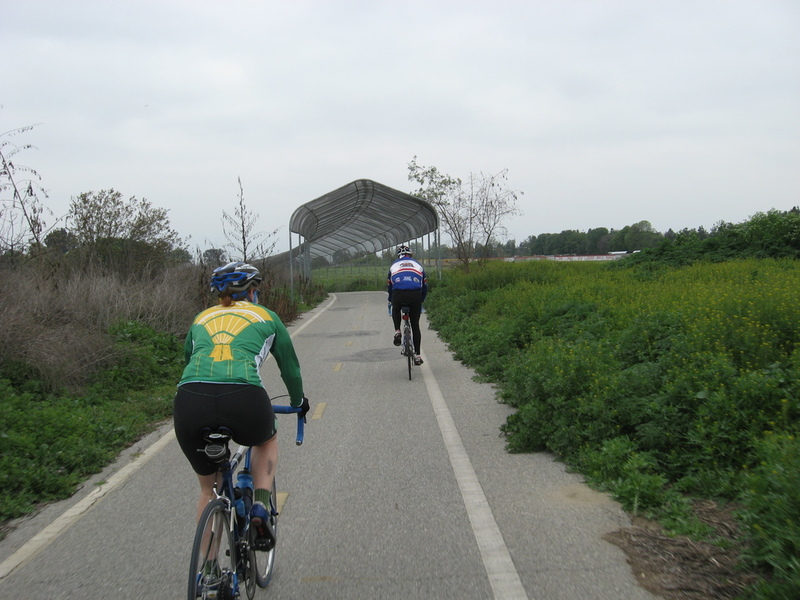 The club met at Live Oak Park in Temple City, and we headed out down the Rio Hondo bike path. 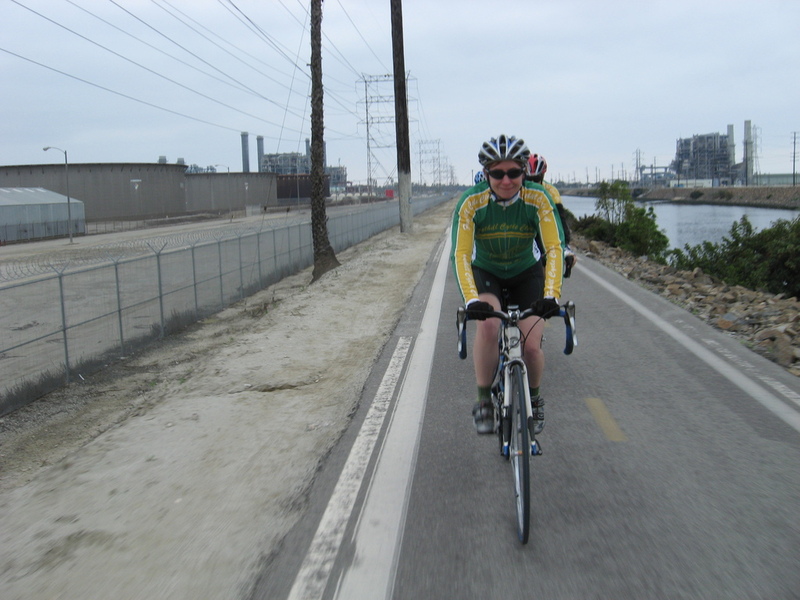 In Whittier Narrows we crossed over and picked up the San Gabriel River bike path, and from there it was a straight shot all the way to the beach. 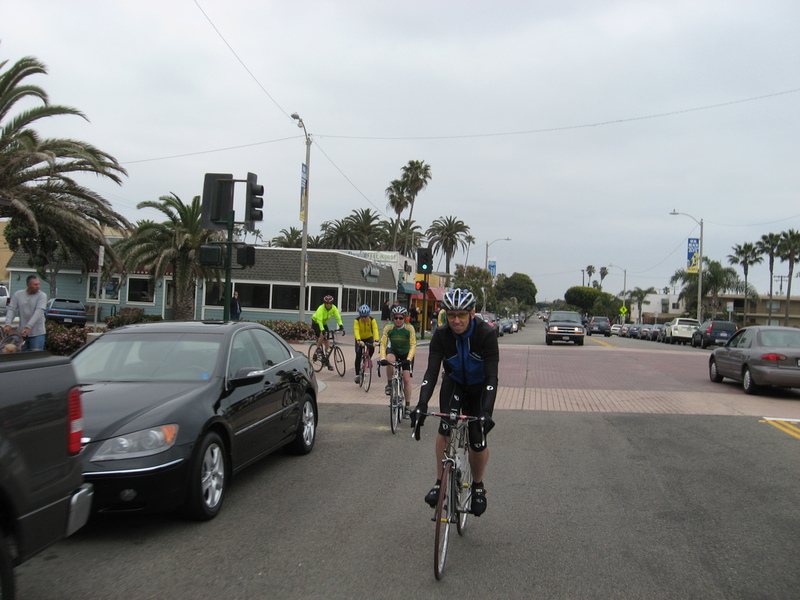 We started out trying to get the group moving a bit faster, and a new guy named Scott took us up on it. He was very strong, and he towed us all the way down there, averaging about 22mph the whole way. At the power plant in Long Beach, I tried to see if I could see any of the green sea turtles I’d heard live there, but the water was kind of murky, so I couldn’t see anything. 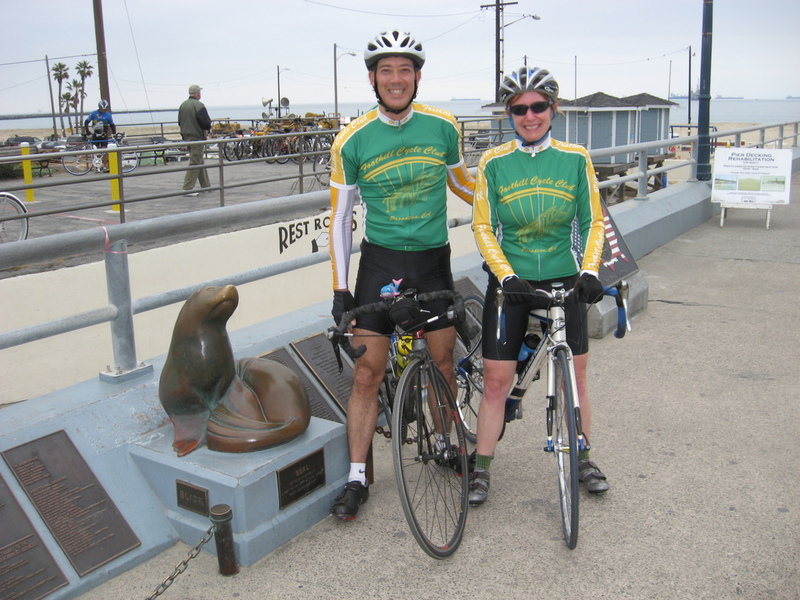 When we got to Seal Beach, we rode down to the pier for a souvenir picture with the little seal statue there. Then we went to the bakery. By the time we got there, the others were arriving. I had a honey-bran muffin, which was quite good. Then we headed out, back up the river. I took a picture of Susan when we rode past the power plant on the way back, since that was place where we had our moment. Then we both just concentrated on hanging on to Scott’s wheel. 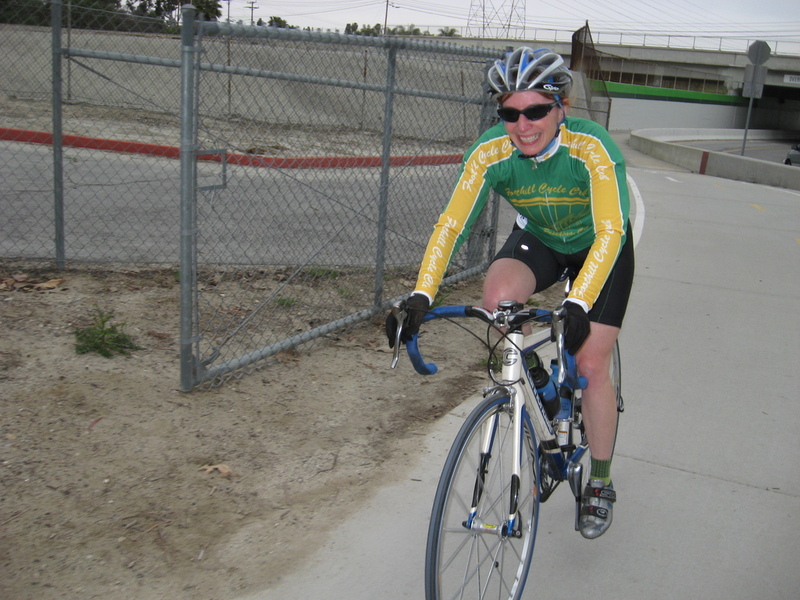 He towed us all the way back up to Whittier Narrows, again averaging over 20mph the whole way. There is a place in Whittier Narrows where people fly radio-controlled airplanes. The bike path has a chain-link cover over it there, for reasons that I guess are apparent. 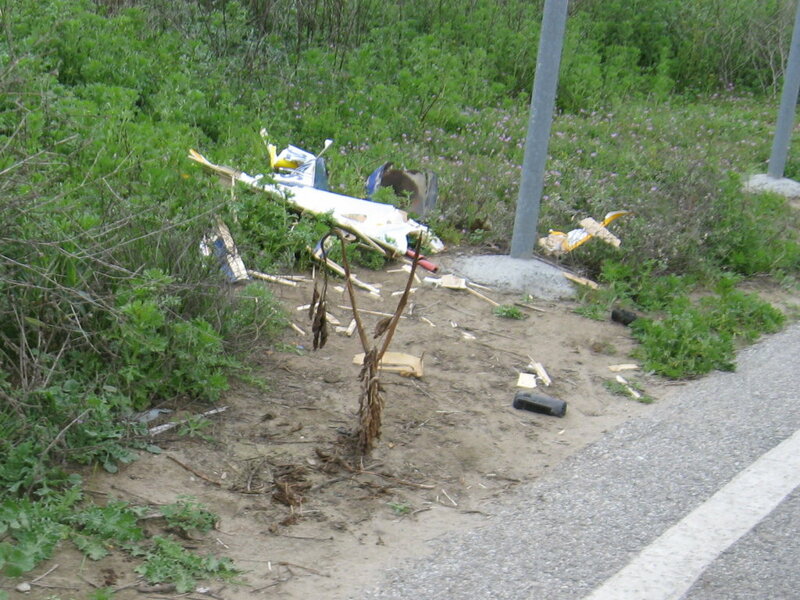 When we were riding through there, I saw the wreckage of a model airplane that had crashed next to the structure. Maybe it got into a fight with the people at the rifle range across the freeway. When we got back to the start, everyone else had turned off to go home. So I rode home with Susan, just to keep her company and be sure she got home all right. 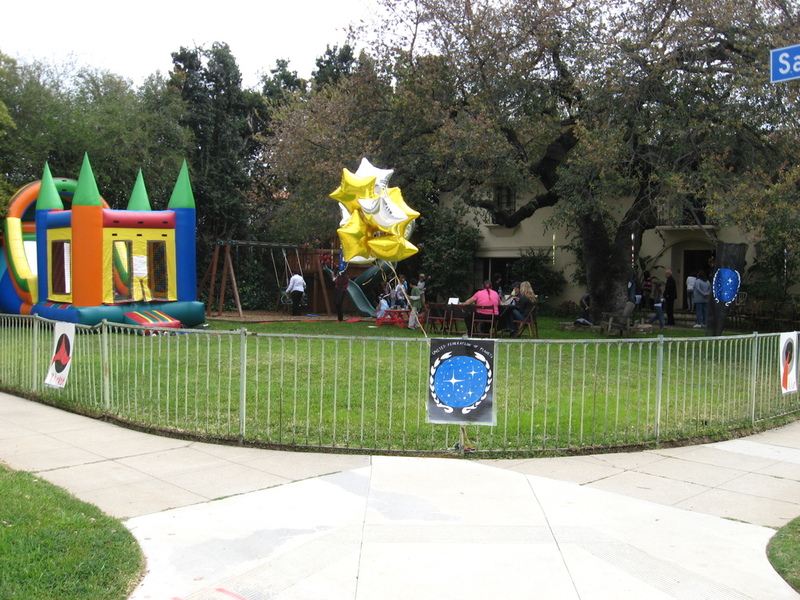 Then I rode home from there, passing a “Star Trek” themed birthday party along the way. That’s something I could relate to. As always, it was a nice ride.